Tell me: how am I supposed to type that in?!? A new expedition set out and found an excellent, well defensible location near a deep river gorge. Things were pretty quiet as the initial tunnels were being dug. Outside the soon-to-be-fortress the dwarves set up a kitchen and still, cooking food and brewing beer. Stockpiles of consumables and materiel were set up, ready to be moved into new storage rooms underground. Then, without warning, a swarm of rhesus monkeys attacked the camp! The monkeys harassed the dwarves, going so far as to bite one of the miners. Several monkeys made off with freshly cooked food. It was utter chaos in the camp! Only a quick-thinking animal trainer saved the day. Rushing to build a kennel, he trained several wardogs which then slaughtered the simian pests. The result: plenty of fresh monkey-meat to replace the stolen food, plus extra leather (for armor) and fat (to render into tallow for soap). Unfortunately, the bitten miner succumbed to an infection and died. UPDATE: Those monkeys returned again. This time they stole a masterwork silver dagger created by a stonecrafter dwarf. The dwarf was so upset by the theft that he threw a tantrum and killed a nearby donkey. This seemed to calm him down for a few minutes, but then he suddenly flew into a berzerk rage! After killing numerous puppies and kittens and felling three of his fellow dwarves, he was finally taken down. My dwarves finally met their end. Endless waves of goblin raiders combined with a lack of proper defenses assured the demise of the fortress. It was an utter bloodbath. 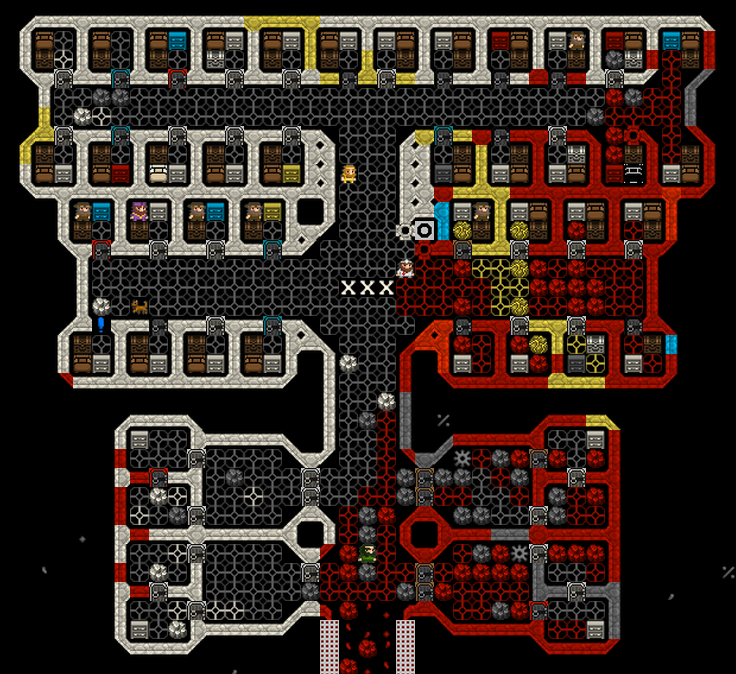 My dwarves experienced their greatest disaster today. I was making a sun room for the dwarves to occasionally gather in to prevent them from getting cave adaptation. 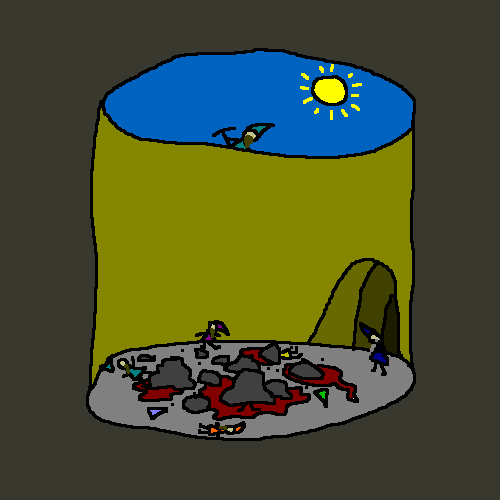 I had already cleared out a room from below and had set the miners to get rid of the topmost layer of earth in order to let sunshine into the room. So, off went the miners to create this new room for their fortress. Of course, dwarves aren’t always the brightest bunch. In this case, the miners dug out the edges of the roof first, leading to partial collapses of the ceiling not once, but twice! The end result? Six dead dwarves, seven seriously wounded dwarves, and two dead mules. Stupid dwarves. I started out on a great map divided by a river with a waterfall. I placed the entrance to my fortress on the side of a cliff in a narrow valley, right beside a waterfall. I started out by digging ramps down a few z-levels, then made a wooden bridge from one side to the other in order to create an excellently defensible entrance. Several months of gametime later, after I had better established the fortress, I decided to replace the bridge with stone and make it raise rather than retract so that it would seal off the entrance instead of leaving it open to flying attackers. After removing the old wooden bridge and planning the new one, my architect decided he needed to get to the far side of the proposed bridge in order to properly design it. So, I created a temporary walkway beside where the replacement bridge was supposed to be, the architect did his job, and the builders put it all together. With the new bridge complete, I wanted to get rid of the temporary walkway (constructed of floor tiles), so i designated the whole thing for removal. 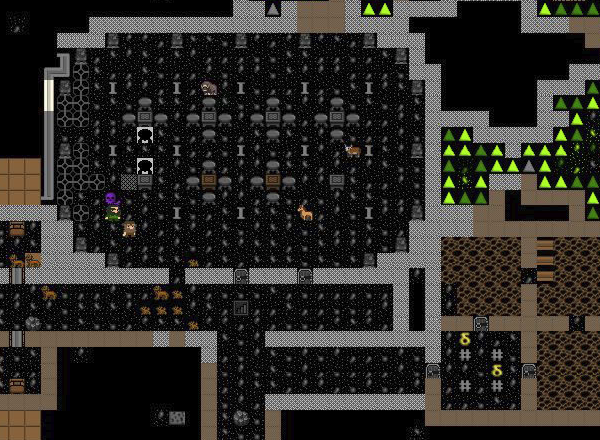 Immediately a group of dwarves swarmed beside the walkway and started taking the floor tiles up. Unfortunately, the two dwarves at the ends of the walkway were more highly skilled masons than the ones in the middle, and they removed their respective floor tiles quicker than the dwarves in the middle. 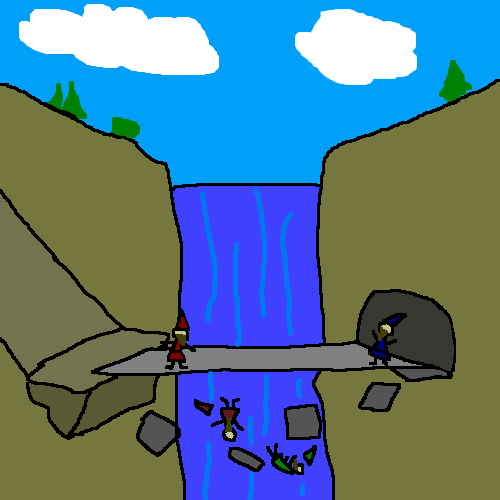 This resulted in the collapse of the as yet not deconstructed middle of the temporary walkway, which in turn caused two dwarves to fall to their deaths into the churning waters of the river below the waterfall. I’ve recently become addicted to playing Dwarf Fortress. Dwarf Fortress is basically a simulator set in a medieval-fantasy setting where the player guides a dwarven expedition into the wilderness with the goal of building a new home. Like most other such simulators, there’s no actual “win” condition; the game is simply a computer generated “world” with its own internal rules on how things work. You don’t actually control the dwarves directly. Instead, you assign various job roles to each dwarf, and they engage in those jobs if there are any available. For example, you might decide to build a wall on a certain part of the map, so you create a construction job — defining the size and location of the proposed wall, as well as the materials that should be used to build it — and then wait for a dwarf with the associated skill (masonry, in this case) to start work on it. The game eschews fancy graphics for the sake of improving game complexity. Although you can easily install graphics packs which make the game prettier, the default game displays everything with extended ASCII characters (similar to Roguelikes). This can be a bit off-putting for players who have grown up before the days of photo-realistic graphics and such. The complexity of this game is just incredible. There are just so many things for you to tell your dwarves to do. There are literally hundreds of different materials in the game with which to construct hundreds of buildings and items in countless combinations. It’s quite daunting to the new player, and I imagine many people never get past the initial steep learning curve (I had actually tried the game once before a year or so ago and couldn’t get into it). You definitely need to do a lot of reading before you can succeed at this game. 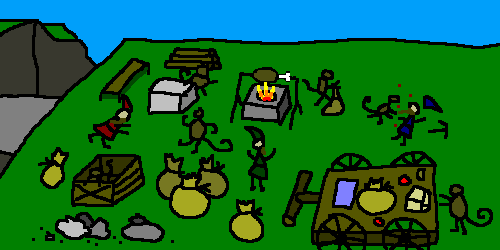 After Action Reporter’s Dwarf Fortress Tutorials – Pretty much *the* guide to getting started. It’s very good (except Part 10 which is out of date) and gives you a good start in the basics of creating a sustainable home for your dwarves. The Dwarf Fortress Wiki – Everything you need to know about every little thing in the game is here, in reference form. Bay 12 Games Forums – The official forums for Dwarf Fortress, hosted by the developer, Bay 12 Games. You can find the answers to lots of questions here. These sites have been invaluable in helping me get started with the game. You will abandon many fortresses in the beginning. When you are just learning the game, you will make design decisions which you’ll soon learn were not that good. Don’t go in thinking that the first fortress you build will be the one you’ll play for weeks. You’ll go through many ‘scratch’ fortresses as you learn how to best place workshops and stockpiles, build retractable bridges, make underground farms, etc. Don’t feel too pressured by time. Though your dwarves start out quite exposed and out in the open (as opposed to being relatively safe within the depths of the earth) you have plenty of time to establish a large fortress before you start to see any real threats from the outside world. It is safe to ignore most of the game’s features. It may seem incredibly daunting at first with all the menus upon menus upon menus, but you really don’t need to worry about 98% of that stuff. When starting out, just focus on the basics: gathering/growing plants to make booze and food, felling trees for building material, and digging some caves to live in. You’ll probably only need to build a handful of workshops to start: carpenter’s workshop, mason’s workshop, and distillery are essential at first. I usually like to build a fishery, too, so I can focus on using plants to make drinks instead of food. The other buildings and such *do* become important later on, though, but don’t worry about it when you are just starting out. Losing is fun! Lots of crazy things can happen in the game. I don’t know of many games where lumberjacks get killed by alligators, as in my previous example of a setback. Also, I never properly buried the dead woodcutter, so he came back as a ghost and haunted my other dwarves later in the game! I’ve had dwarves go insane because they were taken by a strange mood (a state that randomly befalls a dwarf once in a while which prompts them to try to build an artifact) but could not find the right materials to construct whatever it was they wanted to build. 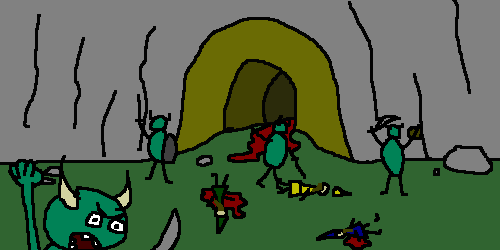 The first time it happened, the dwarf went berzerk and started attacking other dwarfs until we was finally killed. I’ve also had a sizeable colony of fifty or so dwarves almost starve to death as my underground farm stopped producing food (not quite a loss, but it was pretty close). You can make some really nice looking areas in the game, if you’re patient. I will leave you with one last word of warning, though: once you get into it, this game is very addictive! I finally got a copy of Joseph Payne Brennan’s short story Slime, one of the earliest “blob creature” stories which influenced many other books and films, such as Paramount Pictures’ The Blob, Stephen King’s The Raft, and Dean Koontz’ Phantoms. I managed to find it in a monster story anthology, titled Alfred Hitchcock’s Monster Museum, published by Random House in 1982, on AbeBooks.com. It’s supposed to be a classic story. I hope it does not disappoint.